parking cost for additional vehicles in Killbear $78 (3 additional cars). Although the above calculation based on group of 10 and 3 additional cars, we might have 1-2 more people and/or less cars. In that case, the amount will be less than $55 and have to be calculated during the trip. Registration starts on April 11, Thursday at 9:30 pm..... The trip is not suitable for new members who did not hike outside of Toronto before. 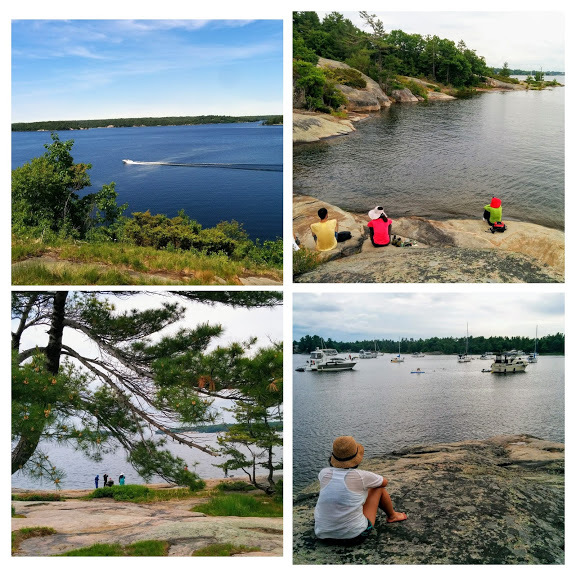 Explore the rugged beauty of Killbear's coastal trails and its sandy beaches, enjoy the breathtaking views and gorgeous sunsets... The most popular park on Georgian bay in summer but not yet crowded just before the start of high season... I booked 2 campsites Each campsite can accommodate up to 6 people, but only 3 tents are allowed on each campsite. Be prepared to share a tent if needed. A MANDATORY PRE-TRIP MEETING TO DISCUSS GEAR, FOOD, CARPOOL etc. WILL BE HELD ON JUNE 5, WEDNESDAY AT 7 PM. We will arrive at Killbear on Friday late afternoon or evening before dusk, set up our camp and have dinner. After breakfast, we will hike (10-12 km) and explore the park. After the hike and lunch, we will have enough time for swimming, relaxing, suntanning. In the evening, there will be a potluck dinner and, maybe, a walk after to enjoy sunset. After breakfast, we will pack up our camp and spend some time on the beach time permitting or check out the Visitor Centre (which has a great exhibit). We will leave Killbear for Honey Harbour before 12 pm and take ferry to Georgian Bay Islands National Park at 1:00 pm. We spend just a bit over 4 hours hiking (ca 10-12 km) on the island and take the ferry back to Honey Harbour at 5:30 pm. Just after 6 pm, we will head back to Toronto. Priority will go to DRIVERS WILLING TO TAKE PASSENGERS and members with previous car camping experience. Additional spots will be added depending on space in the carpool. Once drivers start signing up, I will move people from the waiting list to the event list. The real max. will be 12. Carpool Cost: Approximate vehicle expense for this event is $124.42 (calculated at total Km * $0.221, effective Thursday, April 25, 2019). This is based on $0.08/Km for maintenance, plus current gas price divide by 9. Your event coordinator will confirm exactly how much money is required from each person. Cost Includes: Fees for camping stay $216 (2 nights, 2 campsites), admission to the National Park and ferry to and from island $200 (for a group), parking in Honey Harbour $60 (5 cars) and parking for additional vehicle in Killbear $78 (3 additional cars). The total cost of $554 divided by 10 makes ca $55 per person. This cost does not include carpool, food, firewood.